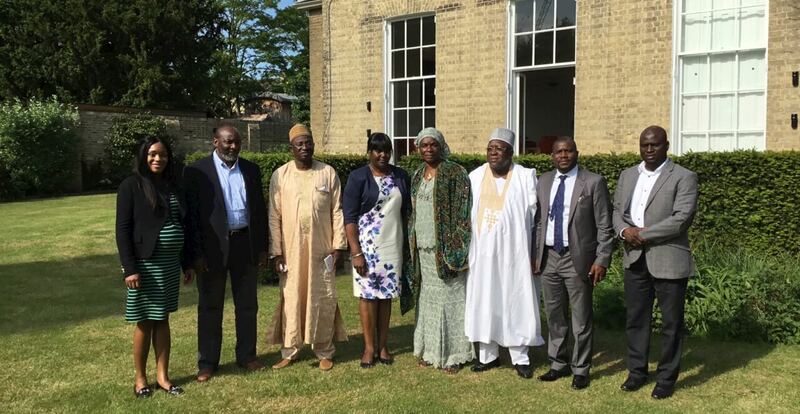 UK based MRL Public Sector Consultants Ltd received dignitaries from the Niger State Government on the Transforming Education in Niger State (TENS) Programme to Cambridge on the 5th, 6th and 7th of June 2016. The honourable delegates were Dan Mai Nasara – Niger State Attorney General / Commissioner of Justice; Shuaibu Bako Adamu – Permanent Secretary Education; Hajiya Fatima Madgudu – Commissioner of Education; and Mohammed Babatifin Mustapha – Permanent Secretary Planning. Dr Roni Ajao the Executive Director of MRL Public Sector Consultants Ltd met the delegates on their arrival at London Heathrow Airport on 5th June 2016. The delegation were treated to a brief guided tour of Cambridge University landmarks followed by lunch before retiring to the Cambridge Belfry Hotel. On Monday the 6th June 2016, the government’s delegation were welcomed to a reception by staff at MRL offices and given a tour of the premises. Members of the MRL TENS team in attendance were MRL’s Executive Director and the TENS Programme Director Strategy and Implementation – Dr Roni Ajao; Zulkifil Abba – MRL Corporate Director and Dr Idris Jega – Project Manager – Infrastructure and Statistical Mapping (GIS), Dr Mya Okeowo – Strategy Consultant and Ms Jane Mirin – Administrative Manager. Dr Mya Okeowo, Zulkifil Abba, Mohammed Babatifin Mustapha, Dr Roni Ajao, Hajiya Fatima Madgudu, Shuaibu Bako Adamu, Dan Mai Nasara, Dr Idris Jega. The occasion was used as an opportunity to find out more about MRL Public Sector Consultants Ltd, it’s vision for the future, public sector clients worked for and examples of government assignments. Presentations were given in the MRL Board Room by Dr Roni Ajao and Dr Mya Okeowo on the progress of the TENS Programme and associated deliverables, more specifically the development of the TENS Transformation Strategy. The visit to MRL’s offices was followed by the delegates’ 2-day planned visit to the Faculty of Education, University of Cambridge, where they were welcomed by the Cambridge Team: Professor Colleen McLaughlin – the Director of Educational Innovation at the Institute of Education, University of Cambridge; Jan Schofied – Teaching Associate with the Schools University Partnership for Educational Research (SUPER) team at the Faculty of Education, University of Cambridge; and Afua Osei – the Business Development Director, Judge Business School, University of Cambridge. The trip culminated in the signing of the Niger State – Cambridge University contract on the TENS Programme by the Commissioner of Education – Hajiya Fatima Madugu and the Attorney General and Honourable Commissioner of Justice – Dan Mai Nasara on the 7th June 2016 on the University of Cambridge premises. The trip was indeed successful!